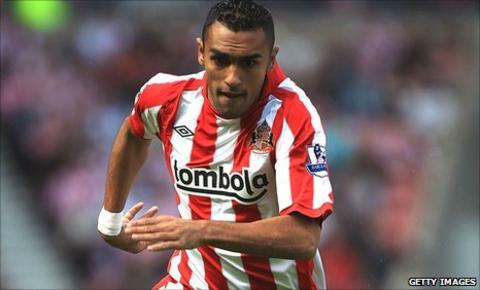 Sunderland have completed the permanent signing of Egypt midfielder Ahmed Elmohamady from Cairo-based club ENPPI. The 23-year-old spent last season on loan at the Stadium of Light in a deal which included an option for Sunderland to buy him outright. That clause has now been exercised and Elmohamady has penned a three-year contract for an undisclosed fee. He becomes the Black Cats' first summer acquisition, with fellow midfielder Jordan Henderson set to join Liverpool. Elmohamady made 38 appearances in all competitions for the club last season and boss Steve Bruce said: "Ahmed has done well in his first season with the club and has shown plenty of potential. "We look forward to helping him grow as a player and I think there is much more to come from him." The completion of Henderson's move to Liverpool has yet to be announced but the two clubs agreed a fee on Wednesday and the England Under-21 international underwent a medical on Merseyside. Reports suggest Sunderland have also lodged a £12m bid with Manchester United for Darron Gibson, John O'Shea and Wes Brown.